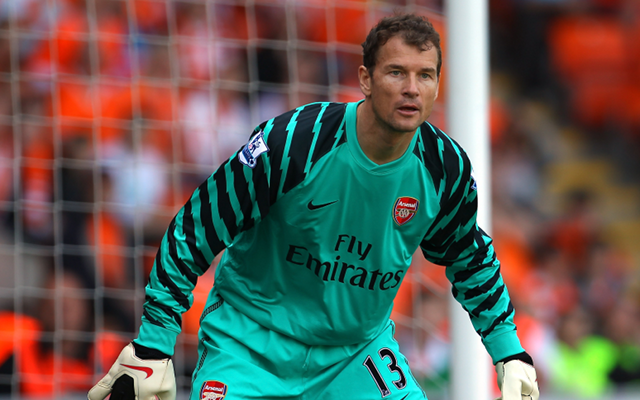 Former Arsenal goalkeeper Jens Lehmann has pulled no punches by insisting that ultimately his old club have ‘thrown away’ the Premier League title this season. The German shot-stopper was a fundamental part of the club’s most recent success as he helped them to an unbeaten season in 2003/04. In turn, he is arguably in a good position to assess the current Gunners squad and their progress, and believes that they had a great opportunity to end their wait for a Premier League title this season. However, despite leading the way a few months ago, their poor recent form has seen them fall 13 points adrift of leaders Leicester City, with rivals Tottenham now the only real competition for Claudio Ranieri’s men with five games remaining. Lehmann has been left disappointed with how the season has played out, and believes that the entire team must stand up and take responsibility. “Have they thrown it away? Yes, it’s a fact, of course they did. The table now is different,” Lehmann said at the Laureus World Sports Awards, as noted by ESPN FC. “So of course I’m a little bit sad. “The Arsenal when I played was probably a little bit different than it is now but that’s football and it always contains disappointments for most of the teams who would like to win the trophy but don’t manage to do that at the end of the season. The former Germany international insisted that the defence shouldn’t solely be blamed having conceded 34 goals this season, as ultimately it is a team effort and that starts from the front. However, it is likely to be a difficult assessment process this summer for the north London giants, who have essentially disappointed on and off the pitch. From Arsene Wenger’s lack of signings last summer to the Frenchman coming under increased scrutiny from supporters for not being able to sustain their title push and win silverware other than the FA Cup. The players have also fallen short of their usual high standards which in turn has led to the predicament that Arsenal now find themselves in, and Lehmann isn’t likely to be the only former Gunners star to be left disappointed by their failures this year.